Paul Menard and the No. 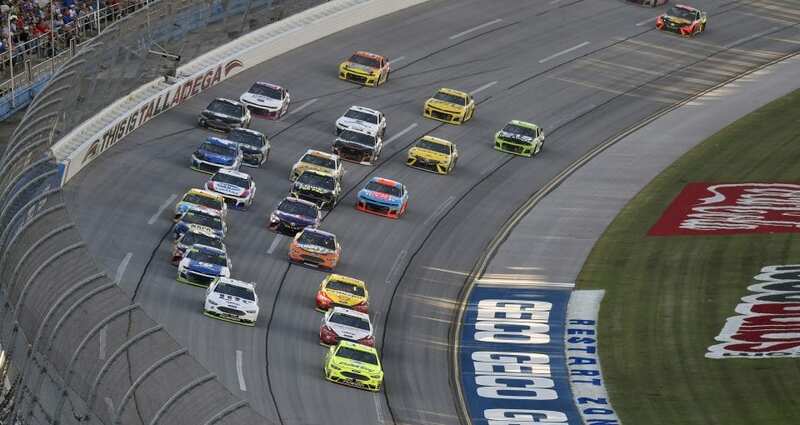 21 Menards/Dutch Boy team battled back from two laps down to finish ninth in Sunday’s 1000Bulbs.com 500 at Talladega Superspeedway. It was Menard’s seventh top-10 finish of the season and his third in the past six races. Menard lined up 30th to start Sunday’s race and had worked his way up to 16th place when a flat tire sent him to pit road under the green flag. The setback put him two laps down early, but the team took a chance by opting to do the wave-around when the caution flag flew shortly after the start of stage 2.. Menard held on until another caution with a handful of laps remaining in that stage, allowing him to be the beneficiary of the feee pass. Greg Erwin opted to pit just before the conclusion of stage 2 and this set Paul up to be able to stay out at the break and not pit with the leaders, cycling up to the 8th position. From that point on, Menard ran inside the top 10 – and often in the top five – and was as high as second at one point. He lined up sixth for a green-white-checkered-flag run to the finish line, but with no drafting help he wound up ninth at the finish as Ford drivers took the win and swept five of the top nine finishing positions. Wood said that once Menard made his final pit stop he did a great job of balancing fuel mileage and maintaining his spot among the leaders. Menard and the No. 21 team head next to Kansas Speedway for Sunday’s Hollywood Casino 400.